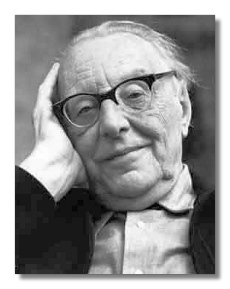 Carl Orff (July 10, 1895 - March 29, 1982) – scholar, educator, and composer – lived most of his life in Munich, Bavaria. Many of his major original works are steeped in Bavarian folklore. After World War I, during which he was wounded, Orff turned to the study of music from the late Renaissance and early Baroque, especially that of Claudio Monteverdi. This would influence his later operas. He gained a solid reputation for his realization of several Monteverdi scores, starting with Orpheus in 1924, and staged and conducted several works by the then-neglected Heinrich Schütz. Orff's first public success came in 1937, with the premiere of Carmina burana, his setting of a collection of medieval poetry found in a Bavarian monastery. During the Third Reich, Orff did his best to keep his head down. His music largely disappeared from the scene, but re-emerged postwar. After the war, he was accused of Nazi sympathies, mainly by people who hated his music. Although Orff's personality was less than attractive, this is actually a lie. Not only isn't there evidence that Orff collaborated, many of his friends were associated with the martyred anti-Nazi Dietrich Bonhoeffer. Most of the evidence strongly suggests that Orff took no interest in politics whatsoever. Orff also became internationally known as a music pedagogue, with the embrace of the Orff-Schulwerk, a huge and continuing collection of pieces for children written in collaboration with Gunild Keetman, beginning in 1935. Orff emphasized the basic elements of music: mainly rhythm and tune in a progress of complication. Children clapped, sang, and graduated to especially-designed instruments that required more musicality than technique. Carmina burana, undoubtedly the hit of Orff's career, was influenced in its style and orchestration by Igor Stravinsky's Les Noces of 1923. It has tended to overshadow the rest of Orff's output, particularly his highly original "Bavarian operas," Der Mond (1938) and Die Kluge (1942). Here, Orff perfected his "folk" style, the seeds of which he had planted in Carmina burana: spare, tuneful, and extremely entertaining. The libretti, written in thick Bavarian dialect, are themselves of very high quality. During and after the war, he moved even further to pare down his music to basic elements, usually tied to settings of classical texts. Highlights of this period include Antigone (1949) and Oedipus der Tyrann (1959), both setting Hölderlin's translations of Sophocles, Catulli carmina (1943), and Trionfo di Afrodite (1951), based on texts by Euripides and Sappho. Orff grouped the last two scores with Carmina burana to form the large stage work Trionfi. At its most characteristic, Orff's music relies on the repetition of short phrases, electrifying rhythm, a more-than-usual reliance on percussion, often in a surprisingly lyrical way, and transparent orchestral colors. Though so different in idiom, his work pays an unapologetic debt to the early Baroque.